Can you tell me how to work this knit pattern? The instructions are: Cast on 130 sts (a multiple of 9 stitches plus 5 more)? The first row instructions are: (RS) K3, *yo,k2,ssk,k2tog,yo,ki: repeat from * to last 2 stitches, k2. Question: Do I cast on 130 sts ? how do I incorporate the 9 stitches plus 5 into the 130 sts? I think I need to put the 9 plus 5 somewhere in between the pattern repeat, but not sure how to do this? By the way the 3rd Row starts with a K2 (then same as ROW 1 and ends with a "to last 3 stitches,K". Hi Sally, I will try to answer your questions in the order that you asked them. I think the problem you are having with the first one is one of terminology. I would say that you are a USA knitter with a UK or Canadian pattern. To "cast on" is the same as to "bind on". If you don't know how to do this check out my page of instructions for casting on. The second part of that same question about the bit that says "a multiple of 9 stitches plus 5 more", you don't need to worry about this bit at all unless you want to use the same stitch pattern for something else. 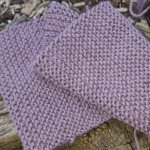 All it is telling you is that the stitch pattern you are using is repeated over nine stitches with an additional 5 stitches at the ends. If you are knitting the pattern as is (i.e. no modifications at all), you can safely ignore this and just follow the directions for each row as you get to it.